There is a low traffic density in France compared to the UK and this makes most journeys very easy; generally the major routes are pretty quiet. However preparation for the journey is important and there are some significant differences in motoring laws, and the ways in which they are enforced, which the driver should be aware of. This is not an exhaustive treatise on French motoring practice and law but does cover some important points. 1. GB sticker unless the registration plates display the Euro GB symbol. 3. Reflective jacket or waistcoat. 4. Headlight adjusters if needed in order not to dazzle oncoming drivers. 5. Breathalyser. (However France has recently stated that a driver cannot be penalised for not carrying one). 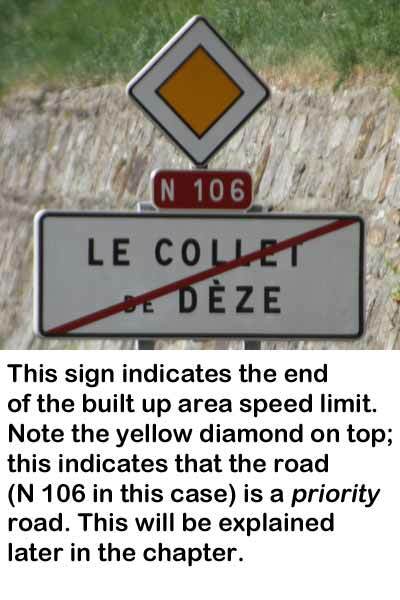 Some authorities, including the French tourist board, suggest carrying two warning triangles and this is our practice. It is sound practice to carry a first aid kit, a fire extinguisher and a pack of spare fuses, and spare bulbs that are user changeable (not always the case in a modern vehicle). It is sensible, and compulsory in some countries, to carry a reflective jacket for each passenger. Most caravans will require extension wing mirrors to give an adequate rear view. Speed camera detectors and speed camera notifications on a sat-nav are illegal in France. 1. Driving licence. Both the plastic and paper parts should be carried. 5. Vehicle on hire certificate (VE103), if applicable. 6. Identity papers, which in practice means a passport, must be carried with you. All documents should be originals, not copies. Scanned copies of these important documents can be uploaded to internet storage servers such as Dropbox or icloud as a backup in case the originals are lost or stolen while travelling abroad. Speed limits differ for motorhomes above and below 3,500kg. Generally, a car towing a caravan where the gross train mass (GTM) of the combination is over 3,500 kg are subject to the same speed limits as a motorhome over 3,500kg. The GTM is the sum of the towing vehicles weight and the vehicle’s towing limit, and is one of the figures given on a plate or sticker which has to be displayed on every vehicle. It is usually under the bonnet. The following figures are a guide to speed limits; there may be local variations. Outside built up areas 90-110 km/hr, reducing to 80-110 km/hr if towing. On motorways the speed limits are 110-130 km/hr when not towing, and 90-130 km/hr if towing. Outside built up areas 80-100 km/hr. On motorways the speed limits are 90-110 km/hr. There is a range of speed limits; generally the higher limits apply to toll as opposed to non-toll motorways. 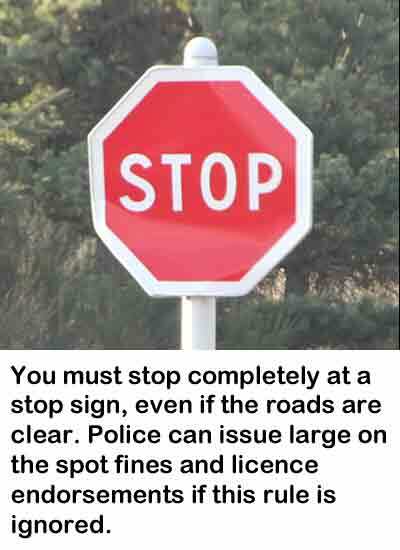 Local signage should be observed to establish the exact limit where you are driving. 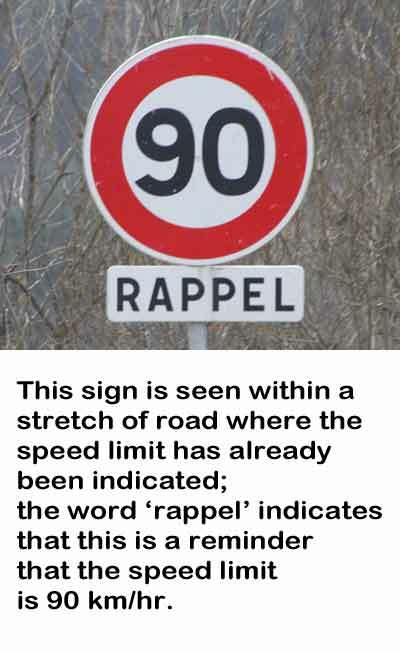 Speed limits reduce in France in adverse conditions such as rain, to 110 km/hr, 100 km/hr and 80 km/hr on motorways, urban motorways/dual carriageways and other roads outside built up areas respectively. If visibility is less than 50m, then speed limits are reduced on all roads to 50km/hr. There is a speed limit for all vehicles in built up areas and villages of 50 km/hr. This reduces to 30 km/hr around schools and in other pedestrian high risk areas; these areas should be signed appropriately and may be delineated by ridges or bumps on the road (‘sleeping policemen’). 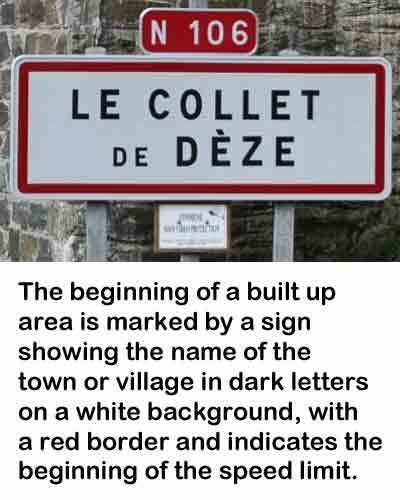 The beginning of a built up area is marked by a sign showing the name of the town or village in dark letters on a white background, with a red border and indicates the beginning of the speed limit. A similar sign, with a red diagonal line through it, marks the end of the speed limit. 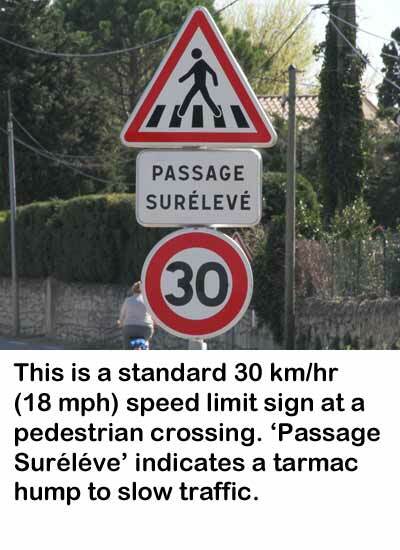 The driver new to France should be aware of this, as it is a very different system to that of the round speed limit signs which mark built up area speed limits in the UK. 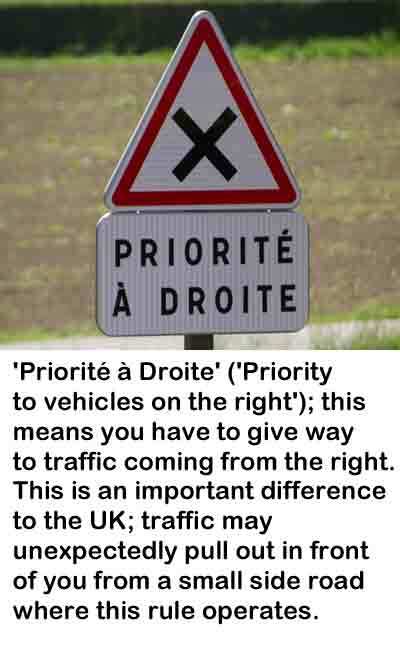 The ‘Priorité à Droite’, which translates to ‘Priority to vehicles on the right’ rule sometimes applies; this means you have to give way to traffic coming from the right. 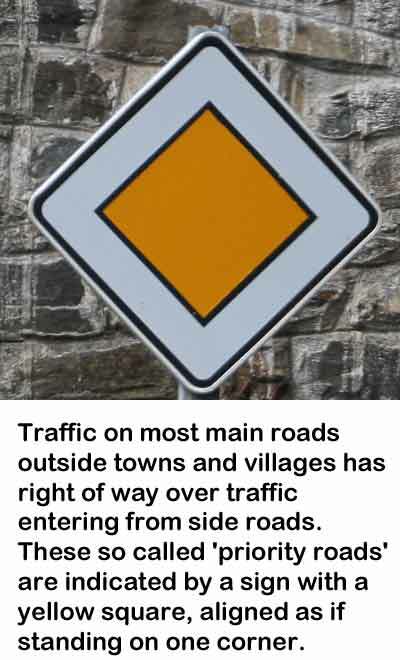 This rule may apply in towns and villages without any obvious signage. 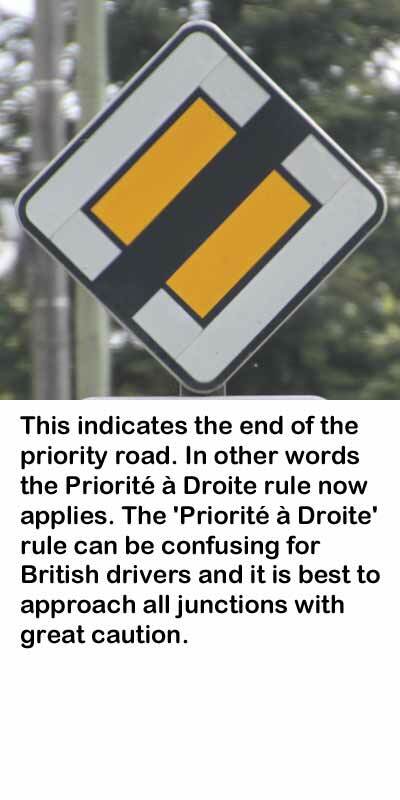 In the example shown in the crossroads roadsign picture further on in the chapter, any traffic joining from the right, at the junction immediately ahead, has priority. French police have the right to issue hefty on-the-spot fines for speeding. These may be as high as €375. A flashing amber light indicates ‘proceed with caution, give way to traffic approaching from the right’. A flashing red light indicates ‘no entry’. Amber does not follow red in the French traffic light sequence. A yellow arrow displayed at the same time as a red light indicates a filter; the vehicle can turn in the direction of the arrow but must give way to traffic and pedestrians. The legal limit in France is 50mg/100ml of blood. This is lower than the UK (80mg/100ml) and random breath tests may be performed. Care should be taken not to plan an early morning start after significant alcohol intake the night before. There is a guide here to continental regulations. Bicycles on a rear carrier should not obscure the rear lights or number plate, if they do then an additional number plate and light board must be incorporated into the bike rack. A scooter or motorbike on a rear carrier must not exceed the carrier and carrier fixing weight limits, and there must be documentation (registration, insurance, MOT etc.) for this vehicle. There is much debate on the motorhome forums about the law, and the local interpretation of the law, concerning pulling a small car using an A-frame. It is clearly not allowable in some European countries. The alternative, towing a trailer which keeps all the cars wheels off the road, is generally acceptable as long as tow bar weight limits are observed. 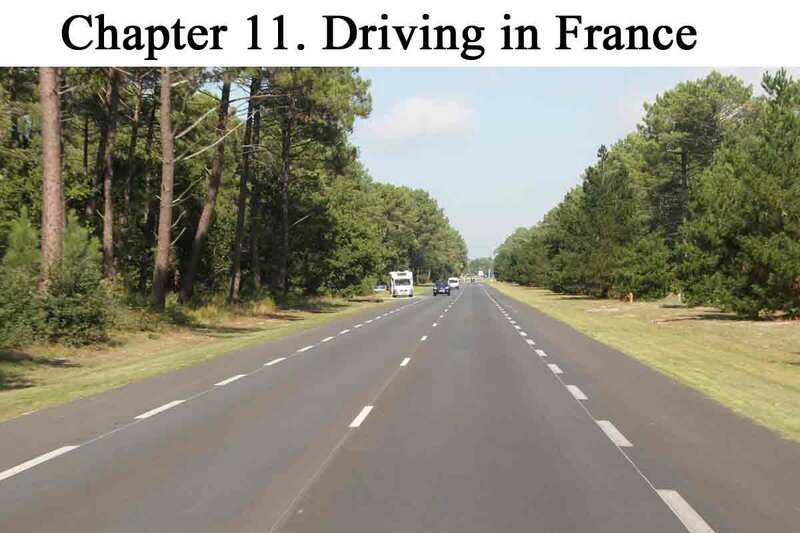 An up to date road atlas of France is essential. Ideally this should be used in conjunction with an updated satellite navigation device which can be programmed with the height, width, length and weight of the motorhome or caravan. As with all electronic devices sat-navs are not infallible and should not be relied on completely. It is not helpful to programme the satnav with the French 5 digit postcode because this covers many square miles. Latitude and longitude parameters are acceptably precise, but of course will not necessarily bring you to your destination via the best access route. If you are travelling at a busy time then it is worth checking sites such as www.trafficengland.com , and www.viamichelin.com for traffic information in England and France respectively. fr.mappy.com provides city centre maps for larger towns in France. There can be heavy traffic on the roads leading to the south from Paris (particularly the A6/7) and it is best to avoid these routes in school holiday time (July/August, and bank holidays) if possible. It is useful when route planning to know that lorries are not allowed on the road in France on the eve of bank holidays and on Sundays. Free wifi is available at all McDonald’s restaurants; this is often of good quality but download speeds may be slow if there are a lot of guests. Stopping at one of their outlets for a coffee or snack is a good way to catch up on emails and browse the internet whilst en route. Some points are summarised here. Laws do change on a regular basis and sites such as about-france.com provide useful updates on current law and other motoring issues. The situation does alter all the time, as legislation, and its interpretation, changes. Seat belts and appropriate child restraints are compulsory. All tyres should have adequate tread depth and be of an appropriate rating for the maximum legal speed of the vehicle. Winter tyres and/or snow chains are mandatory on some French mountain roads in winter. Vehicles using snow chains should not exceed 50 km/hr. In case of breakdown a warning triangle or triangles should be placed to to warn oncoming traffic. There is conflicting advice as to the distance from the vehicle that the triangle should be placed. A range of 30 to 150 metres is usually suggested, with at least 100 metres needed on motorways. Any occupants leaving the vehicle whilst it is stopped on the carriageway should wear a reflective jacket or waistcoat. Dipped headlights are usually mandatory in tunnels and it is not uncommon to see police cars at the exit of even well-lit tunnels, checking compliance. As previously noted, speed limits are tightly controlled in France. It is forbidden to overtake if this involves crossing a solid or double white centre line. Outside built up areas, motorhomes or car/caravan combinations weighing over 3,500 kg must leave at least 50 metres between themselves and the vehicle in front. They must only use the two right-hand lanes on roads with three or more lanes and should slow down or stop where overtaking is difficult to allow smaller vehicles to pass. Stationary trams cannot be passed if passengers are getting on or off. Parking or stopping on the left hand side of the road is only allowed on one way streets. A parking disc is needed in some towns and cities. There are roadside signs and road markings controlling parking. Motorhome parking in cities can be difficult; we have found that city centre aires and supermarkets have both been useful on occasions as a way of getting the motorhome in to large towns or cities. We always replenish stocks if using a supermarket as a parking point and see this as a fair exchange. There is always the risk of theft when leaving a motorhome or caravan unattended and this should be minimised by a common sense approach; we avoid empty aires in run down areas, leaving the motorhome in quiet or unlit supermarkets at night and so on. If there is any doubt about the security of a supermarket car park one of us will stay in the motorhome while the other shops. There is currently (2014) an increase in the volume of reported criminal activity in the supermarket car parks and aires surrounding Calais. The bigger cities often have good transport systems and there is an excellent tram and bus network for example in Bordeaux which can bring you in to the town centre from a camp site in the suburbs. The Bordeaux Tourist Office has an excellent English language web site, giving links to bus and tram routes and timetables, and other useful information. 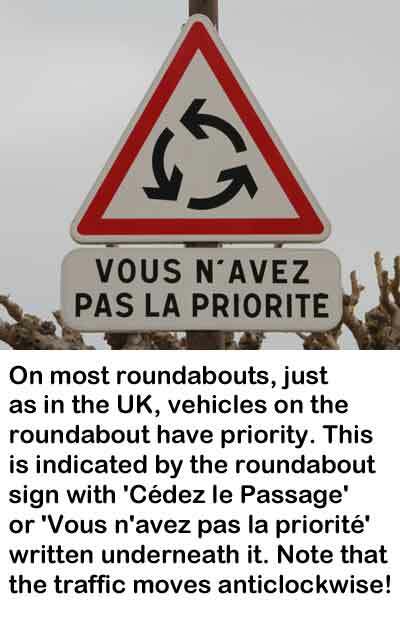 Whilst French roads are generally of good quality and quiet, by British standards, the numbering can be confusing, as many roads have both a national N number and a Departmental D number. There is a good network of motorways (autoroutes). Many of these are toll roads and referred to as Péages. Charges vary and tend to be higher in upmarket regions such as the south of France. Sections around major cities are usually free. Motorway tolls are levied on vehicles depending on their classification by categories 1-4. Most motorhomes and caravans fall in to category 2 (height from 2-3 m, weight under 3,500 kg) and category 3 (height 3m or more, weight over 3,500 kg). Payment can be made by cash or credit card; the appropriate lane should be selected as the toll booths are approached. Green arrows indicate open lanes; don’t enter dedicated telepéage lanes (marked with a t) unless you own a telepéage device. If you enter a telepéage lane by mistake call the attendant who will open the barrier for you and ask you to drive over to their control centre to pay there. Distance times between toll booths are recorded and vehicles which have been speeding are identified this way. A lot of péage driving will incur substantial tolls and many find that slightly slower but pleasant progress along the N roads (the old ‘Route Nationales’) is a better option than the autoroutes. Those taking the autoroutes can break their journeys at the generally high quality aires which are provided at regular intervals. The ‘aires de services’ provide fuel, water, shop and restaurant while the ‘aires de repos’ have picnic areas where dogs, children and other animals can be exercised. It is recognised that motorway aires can be targeted by thieves and it is advisable not to leave the motorhome unattended. Sleeping overnight on a motorway aire is not recommended. Diesel is generally cheaper in France than in the UK, petrol is currently comparable in price. As in the UK, fuel prices are cheapest at hypermarkets and supermarkets. Diesel is ‘Gazole’ in French. Petrol is ‘Essence sans Plomb’. A useful website is www.zagaz.com which will give you the current price of fuel, including lpg, throughout France, at over 50,000 outlets. Checking in February 2014 showed a range of prices between €1.28 and €1.59 for a litre of diesel in Haute-Normandie. Pretty! This was a reaslly wonderful post. Manyy thanks for supplying this info. Very useful section Thank you. We are considering venturing to France in 2016 – difficulty is there are so many great places still to discover here in UK first!